I’m a stickler for user interfaces. In this case, the user interface of a toaster in the break room at my office. 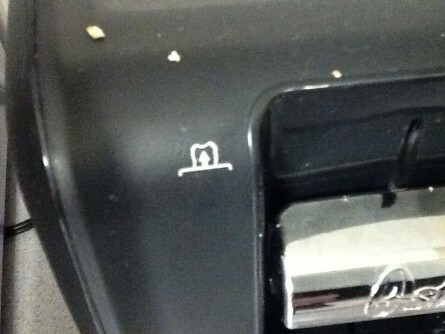 There’s an icon at the top of the toaster, just left of the lever you push down to insert the toast. Here’s a better picture so you can see the icon more clearly. The icon is of a piece of bread evidently coming out of the toaster. Now, you and I know exactly what this lever is meant to do, so I can only ascertain that this icon is intended to aid someone who has simply never seen or heard of a toaster before (perhaps he/she was raised with wolves or is from another planet). The thing that’s getting me, though, is how exactly the presence of this particular icon would help this hypothetical user? Why does the arrow go up and not down? Is the icon somehow meant to convey that, after I push the toast down, I can use the same lever to get it to come back up? But in that case, what is the “cancel” button for below and to the right of the lever? Now, to be fair, I’m trying to think of an icon myself that would convey the intended meaning, and I’m drawing a blank. It seems to me the use of a toaster is so obvious that you don’t need an icon at all. What do you think? Would the icon make more sense if the arrow went down? Would you advocate the use of an entirely different icon or no icon at all? 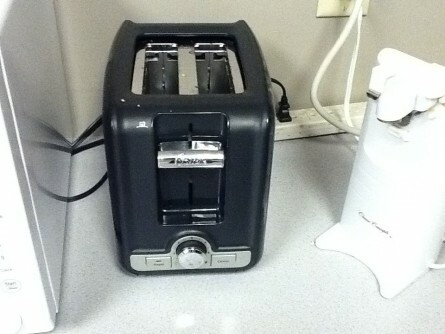 This entry was posted in essay and tagged design, toaster, user interaction, user interface. If I were to try and put some sort of indication of how to operate the toaster, it would probably need to be larger than a little icon. I would consider some sort of arrow on the lever. Probably pointing downwards. That’s the Toast Lift icon. Hm, yeah, see, you actually just made my central argument better than I could have made it myself. A good user interface (this is a toaster for crying out loud!) should be intuitive enough that I should never have to RTFM (for the uninitiated, this stands for “Read The F***ing Manual”). A way to lift the toast out of the toaster is actually a very useful feature for a toaster to have (my toaster at home has this, but it is implemented in a different way), but I could not figure out that this toaster has that feature without reading the manual (well, actually, in my case, I could not figure it out without blogging about it and waiting for one of my visitors to read the manual and comment about it). If I have to read the manual (or wait for you to read it for me), then what good is that hieroglyph on the toaster doing for anyone, other than making the toaster a little uglier? I suppose it serves as a reference, a kind of footnote, that points me to the manual, but—I mean, sheesh—why don’t they just start sticking numbers all over the toaster and a big message on top of the toaster that says, “To figure out what all these numbers mean, RTFM”? i find it troubling that the manufacturer of this particular appliance would deem it necessary to apply such an icon indicating exactly how to use it; unless, as you speculated, they in fact ARE from another planet; it reminds me of an assignment we were given back in elementary school: to explain, in GRAPHIC DETAIL every single step involved in the construction of a peanut butter and jelly sandwich!